The HazCom team can look back at a long and detailed history within Philips. Almost 30 years ago the team was founded to service the business as expert advisors on safe handling and shipping of hazardous material and finished goods and authoring of Safety Data Sheets for the like. Just like any unit within a multinational company also the HazCom team went through various changes over the past three decades. In 1992 the team was known as ‘ADEX Gevaarlijke Goederen’, which stood for ADministratie, Douane en EXpeditie. In English: Administration, Customs and Shipping of Dangerous Substances. By 1996 the team was only referred to as Dangerous Goods. This had not changed until July this year when the team altered its appellation into a more descriptive name: HazCom, an acronym for Hazard Communication which describes the activities and services of the team more accurately. Not only did the various name changes accompany the team, but also changes in management and a continuous expansion of their service and their key focus. Back in the days so-called IGS (Informatie Gevaarlijke Stoffen/Information Dangerous Substances) were drafted, later known as Veiligheidsinformatiebladen (Safety Data Sheets). Workplace Instruction Cards (WIC) and Labels were added to the portfolio soon after. Since this year SDS, Labels and WICs are accompanied by so-called iSD (internal Safety Documents). Design wise they resemble an SDS, however, the content focuses on serving workers directly on the work floor with regards to safe-handling. WICs slim this information even more down to one page. Andries Willemsen and Hans Brandsma, both retired now, have been the team leaders in the past. Svenja Rupp has taken over the role as competence team lead and is driving change forward. 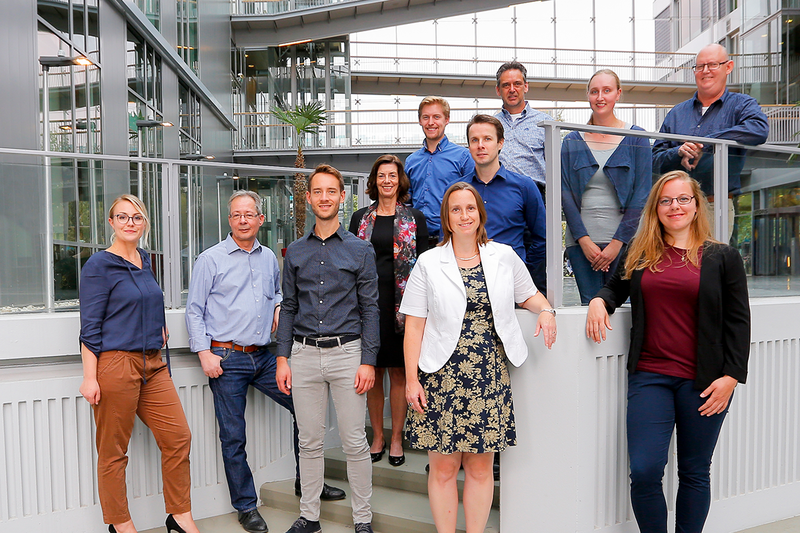 Roland Swemmer, a soon to be analytical chemist, joined the team a little over two years ago as an assistant chemical safety manager, in the framework of the WGP initiative of Philips. Starting as support of various tasks, Roland has developed himself as an expert of Occupational Exposure Limits inside and outside of the EU. Furthermore, he is responsible for observing anything related to Export Control matters. With his strong sense for quality and accuracy and his profound awareness of change within the framework of chemical regulatory affairs, Roland has established himself as an indispensable member of the team. Ingrid Das is one of our senior experts and Chemical Safety Managers and consultant with a background in chemistry. She has almost 20 years of experience in the field of managing dangerous goods and hazardous material resulting in profound knowledge on safe use, storage and transport of the latter. She has been part of the team since almost the beginning and can hence look back at a fruitful history within HazCom. Her specialties are Environment, Health and Safety (EHS) topics related to chemicals, transport and packaging of dangerous and finished goods (e.g. lamps and lithium batteries) as well as authoring and validating Safety Data Sheets (SDS) related to REACh/CLP. Additionally, she is a certified transport Safety Adviser in the field of transport of dangerous goods by road (ADR), air (IATA; including Radioactive materials) and sea (IMDG). Derek Boender has a bachelor’s degree in chemistry and teaching. He joined Philips Innovation Services about two years ago as a Chemical Safety Manager in the Hazard Communication team. Besides his very good chemical regulatory knowledge that he has acquired over the past two years, Derek has also established himself as a professional customer relations personality within the team. With his calm and analytical mindset, he understands customers’ wishes and manages to exceed expectations time after time. About his drive, working for Philips Innovation Services, he says himself that working with customers on their every day’s challenges when facing chemical safety is a strong motivator for him. Personal drive and interest in the field of chemical safety energize him and this he shows back on the work floor. Frans van Niftrik is our senior coding specialist working for Philips for more than 35 years already. With an educational background in chemistry, he links the chemical product composition and GHS/CLP classification with the coding software within Philips Innovation Services. Above that, he is the responsible lead retrieving up to date country-specific and compliant supplier SDS for Philips and other customers. A role that requires a cool head in times of an avalanche of documentation. “What I like about this job?” he asks back, “It’s the variety of people I have contact with, and the pivot role I have within Philips and within our team.” Frans has developed himself as an unmissable part of the team. With his calm and profound knowledge, he is our solid rock within HazCom. Bas Gerritsen is our newest and at the same time youngest team member. He studied Chemistry and Crime Science at the University of Applied Science Saxion in Enschede and started working for Philips Innovation Services in May this year. He currently is in training to become a chemical safety specialist, entailing understanding the REACh and CLP regulation. I asked him why he chose to work for us and his answer was clear: “I like working here because it gives me new challenges, and every week I feel that I learn something new. Next to that, the people on the team are very nice. In the future, I would like to lead my own projects and maybe lead my own small team. At the same time, I want to follow some courses parallel to my work, so that in the future I can earn my master’s degree”. As you can see, the future of HazCom is secured. Hedy Cox is our senior chemical safety and data manager with more than 25 years of experience in the field of managing dangerous goods and hazardous materials and part of the HazCom team since the very beginning. For many years she is responsible for the infrastructure, functionality and the regulatory content of the Fasim tool. Additionally, she made sure that the operational flow within the team is streamlined. She monitores Europe wide DG regulations. Next to these assignments, she is specialized in determining the symptoms of hazardous substances and mixtures and is responsible for the final check of any SDS authored within the team. Hedy is very committed to her work and we truly value her years of experience she brings to the team. Juliette Herin, French from origin, owns a Master in Environmental Sciences and works for Philips Innovation Services for almost 5 years. Since 2 years she commits half her time as support to the HazCom team. She has established herself as a solid member of the team, not only by maintaining and authoring of Safety Data Sheets but also as the lead trainer on component data evaluation and research. New team members are her protégés and thoroughly guided by her. We fear the day she will fully commit her time again to team sustainability and life-cycle assessments, but till then we enjoy calling Juliette one of us. Robert Coolen started his professional career in 1986 as a chemical laboratory technician. Since then he held several positions, amongst which within Quality Control, Product Development, Process Development, Product Data Management, Regulatory Compliance and providing of training. His expertise goes from REACH, CLP, RoHS, WEEE to ADR, IMDG, Detergents and Export Restrictions and above that, he is certified as ADR and IMDG transport advisor. Like Bas, also Robert recently joined the HazCom team. About himself, he says that he finds personal satisfaction in helping people to make their lives and work better, safer and easier. His main driver is a profound interest in chemistry and how to make sure hazardous chemicals are handled in a safe way during their entire life-cycle. Michelle van den Boom is, like Roland before her, part of the Philips WGP program. Last year she graduated from Fontys Hogeschool Eindhoven in Applied Sciences in biology. In November 2017 she started as Assistant Chemical Safety Manager within the HazCom team. Originally entailed to support the chemical safety managers maintaining the chemical substance database, she was fast trusted with more profound and challenging work. In record time she has established herself as a crucial part of the team. She is part of the core team authoring and evaluating Safety Data Sheets in compliance with CLP. She has a keen mind, thinks exceptionally fast and is very conscientious. A team member that truly enjoys the challenge. Jan Bart Biemans is lovingly called the ‘god-father’ of our Fasim software tool. Ever since he got his first PC as a teenager his interest has always been with computers and programming. First a COBOL programmer, Jan Bart re-schooled early 2000 to a Java programmer. A switch that paid off. Around that same time, Jan Bart was assigned to create the early version of Fasim. He thrives trying out the latest state of the art programming techniques to (re)build new and existing functionalities. About himself and his relationship to Fasim he says: “The fact that I already know the business logic behind Fasim, is the reason I never get tired of it. While working on it I still keep on learning new techniques and developing myself as an IT specialist.” I have never met a person more passionate about his work and the entire team is very happy to have him onboard. And my name is Svenja Rupp. I am the environmental toxicologist and competence lead of the HazCom team since late summer 2017. By origin German, I immigrated to the Netherlands almost 6 years ago. With multiple years in regulatory consultancy and the direct industry I eventually made a switch to Philips. A company I always hoped to work for one day. Early in my career I stepped into the field of global hazard communication and have ever since grown my expertise. I am more than convinced that communicating safe working with chemicals is more than a corporate responsibility, it’s an individual mindset of anyone exposed to chemicals. Together with the team, I enhance the safe way of working for external companies but also Philips own workers on the shop floors around the world. When the EU REACH regulation took effect about 10 years ago a whole new manner of managing and controlling chemicals in Europe had taken effect. One supporting regulation in this matter was the Regulation (EC) No 1272/2008, also known as the CLP regulation – the EU translation of the UN GHS standard. As REACH has proven its success over the years more countries around the world were triggered and stimulated to re-think their national chemical laws. Currently far more than 35 countries have adopted the UN GHS through their local regulations and standards, however, creating still a discrepancy in chemical hazard evaluation. Each country sets different compliance requirements and has not always adopted the same revision number of the GHS purple book. On top of that did not every country adopt the same hazard classes, resulting in different hazard classifications for different regions. This divergence is also known as the GHS building block approach. The HazCom team of Philips Innovation services is able to classify chemical products according to global GHS and EU CLP and provides SDS in various regional formats.